Expanded Text Ads Part Deux: Adster’s 90 day, Big 3 Takeaways - Adster Creative Inc.
Last August, I discussed how we Adster folk were dealing with Google’s new expanded text ads. It was the dawn of a new era, and after a decade of perfecting short copy, our team was unsure of what to expect with all the new characters we suddenly had available. To make matters worse, we have many accounts that do not receive a particularly large amount of impressions and clicks each month, leading to what we affectionately refer to around here as the small data anomaly (Note: regular readers will be happy to learn that Libby no longer sweats the small stuff). However, with a full 90 days of data across hundreds of accounts, what do we know about expanded text ads? Is this something that small businesses in Canada should be paying attention to? Are they all they’re cracked up to be? For this client, bigger, juicier ads were not enough to offset messaging that was clearly resonating with ad clickers. Above, the inclusion of ad-copy ‘New Patients Welcome’ outperformed any ad – regardless of size – that did not include this in the copy. We ‘old schoolers’ often go back to our classic CTR tool belt when building ads. We know that symbols, numbers, and other characters that break up pure text ad copy are typically attention getters. Above, BOTH of our dreamy expanded text ads lost out to an old classic in the standard ads: the pound sign. What if we used this technique in our expanded text ads? Takeaway: second verse, same as the first – always be split testing your ad copy. We know that Google’s Adwords system is auction based. As such, it’s not just how much you’re willing to pay, it’s how well you tie a user’s search query to an ad and landing page. With more character’s available to communicate a strong value prop ALONG with words that tightly align with a user’s query, there are some l33t level gains to be had in quality score. Above, check out how the expanded text ad pulls more than DOUBLE the CTR of the standard ad, resulting in a near 40% higher ad position for 30% less cost. We found that this was most prevalent in ad groups where modified broad keywords were used, and keywords like ‘dentist’ / ‘dentistry’ and ‘south’ / ‘south side’ could all be included in the ad. Takeaway: Quality = Score! Additional characters in expanded text ads provide opportunity to make significant gains in quality score. #3. What’s our competition up to (or not up to)? This one has been a little trickier to pin down, and granted, is most likely temporary as expanded ad intel hits the streets. However, one major consideration here is determining how many of your competitors are using expanded text ads? An expanded text ad with all the bells and whistles in a lower position is very likely to CRUSH poorly built standard ads in higher positions. In the example above, we may be quite content to park ourselves in position 4, understanding that our CTR and average CPC in this position pose an incredible value for the client based on what our slow to adopt competitors aren’t doing with their ads. 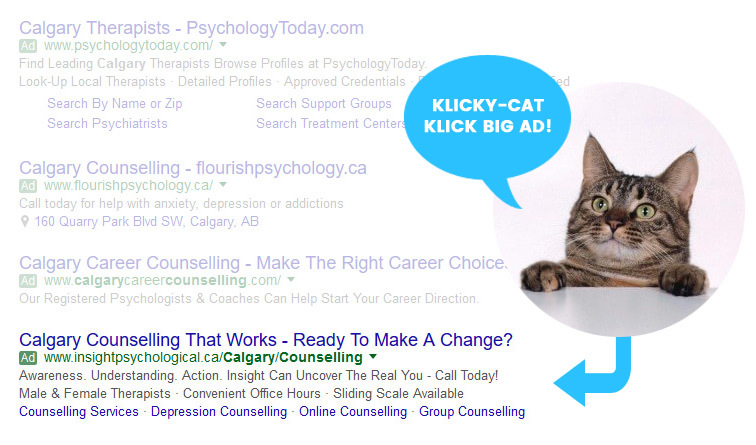 Ultimately, 4 out of 5 cats click big ads in position 4*. *Backed by absolutely zero factual data. Takeaway: Know your neighbors, and have the best curb appeal on the block. There’s money here. You’re still split testing your ad copy, understanding great copy still beats all. You understand what your competition is (or isn’t) up to, and ‘strategize’ accordingly. Of course, there are several other considerations in addition to these, and for continued reading check out Frederick Vallaeys great post on Search Engine Land and another here by Mona Elesseily. Have a story to share about expanded text ads? Huge win? Epic loss? !